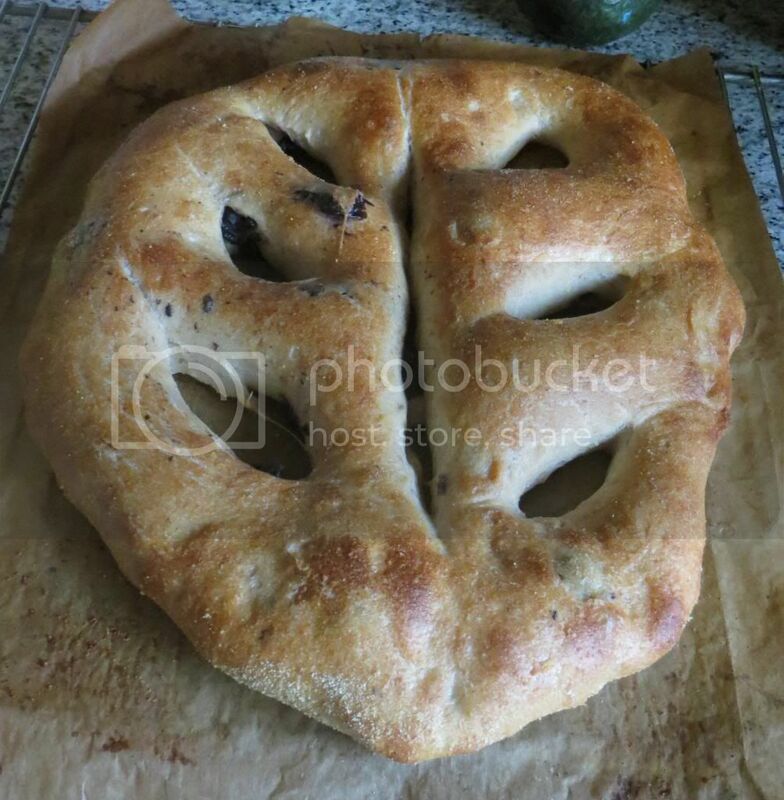 I've wanted to make an olive fougasse for a long, long time, but never got around to it until today. Served it for dinner along with a white bean soup that's a lot like the well-known U.S. Senate Bean Soup recipe. Mix up the pre-ferment the night before, knead it and let it rise 12-16 hours. Once the pre-ferment is ripe (it should have domed and collapsed slightly in the middle), break it up into about 10 pieces and mix with the other ingredients. Develop the dough, adding the olives at the last minute (I sprinkled half on the flattened dough, rolled up the dough, flattened it again and repeated) and let it rise for 1.5 to 2 hours. Shape it into a boule and let it rise, covered with plastic or baker's linen for another hour or so. Meanwhile preheat a stone and a steam pan to 500 degrees F. Once the dough has risen about 50% or more, stretch it to half again its length and shape into a rough triangle. Using a knife or a pizza cutter, make one long cut all the way through the dough down the center, with three others along each side so it looks a bit like a leaf. Stretch the dough to open the cuts. Bake the fougasse with steam for about 20 minutes at 450 degrees F. Serve warm. Hi trailrunner! This formula uses a "pate fermente" which is French for "fermented dough" or "old dough". It replicates an old and simple way to improve the quality of bread: make more dough than you need and hold back a portion to include in the next day's bake. This recipe is based on Jeffrey Hammelman's in Bread, one of my favorite bread books. It's nice to see you again on TFL! The site ate my comment again and just posted the subject - very frustrating - oh well. Nice to see you posting. Like trail runner said - your recipes were some of the first I tried when I found this site too. I am a whole grains baker and your loaves fit my profile! I still recall watching your video of shaping a sandwich loaf with your daughter helping out. I imagine she is a teenager now! How time flies. Anyway, what a beautiful loaf. The shape and the color of the crust are very inviting indeed. The addition of olives in the dough can only make it all the better eating.